Hi Friends! I am excited to be back. Today my blog has completed one whole year and I am extremely happy. I am always happy when I bake. But I didn’t want to do any cake for this day. I just did a very easy breezy eggless biscuit to enjoy with a cup of coffee. Today is a very special day for me. I have been out of the blogging world for nearly two months. The reason is that my camera stopped working. Yesterday my hubby took me out and presented a cute Nikon DSLR. Today is my first day with my new camera. That along with the blog anniversary makes it very special. I want to thank my readers for making it possible to complete one whole year. I will try to improve my blog with nice pictures and great recipes. 2. Mix flour, baking powder, salt, sugar and sesame seeds. 3. Add very cold butter and mix it with the finger tips. The flour will resemble bread crumbs. 4. Add curd and mix. At last add the milk and bring the dough together. Do nor over knead the dough. 5. Roll the dough into a circle on the counter. 6. If you want crispy biscuits, then roll the dough into thin circle. 7. If you prefer soft biscuits, then you can roll it to 1/3″ thick. 8. Cut using a biscuit cutter and arrange the biscuits on a foil lined baking tray. 9. Bake until the biscuits are golden. It may take anywhere between 10-15minutes. 10. Cool on wire rack and store in an air tight jar. 11. Enjoy with a cup of coffee. hi its great to see that you r happy! will try this eggless recipe. 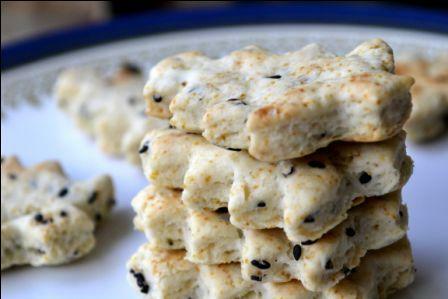 check out my version of sesame biscuits (wt egg) too!